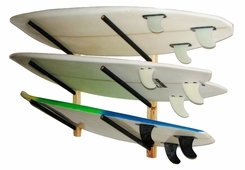 Triple Wall Surf Rack. In addition to vertical storage, we've got the classic horizontal wall storage racks with space for three boards. Gives a little less of the shop feel and a better display option for inside your house, but also still ideal for garages, sheds or your bedroom. Foam padded arms ensure that you don't ding your board when you get the call that it's firing and rush to grab your board out of this rack. Surfboard Stands. 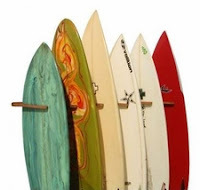 The latest "innovation" in surfboard storage, if you want to call it that, are surfboard stands. The stand is just that - a stand that holds one surfboard. No installation, screws, or mounting is required, which means the stand can be moved wherever you want at any time. Take it with you when you travel, move it around your house - whatever - the stand is ready for your board. Stands come in 2 different types - stands requiring a center fin to secure the board or stands that don't. We've got both! Check 'em out. Surfboard Hanging Straps. 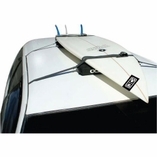 For the most economical ($14.99) and easy way to hang your surfboard, check out these surfboard straps. Attach the straps to a wall in your house or garage and slide your board through them after a session. No nonsense approach to surfboard storage. For a single board only.